We would like to warn all customers that the online stores or eBay users listed below are the malicious sellers who are making fake and unauthorized use of photos of our products which we own all the copyrights. **And this list is just the tip of the iceberg. 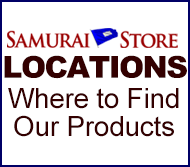 We, Marutake Sangyo, co ltd. as a manufacturer and Samurai Store International as an authorized distributor, have NO relationship with any chinese seller and we are not responsible for any of your claims, loss, damage and whatever happens by their unauthorized Chinese copies. Again, we have NO stores, NO warehouses, NO subcontractors, NO sales agents, and NO business partners in China. Please be very careful and always ask questions about where the they came from if you consider the purchase of samurai armors. We regret for any confusion they may cause, and sincerely thank you for your kind understanding.